Prepared using light sour cream. In a small mixing bowl, stir the 1 teaspoon lemon juice into sour cream; cover and chill. Cut apples into thin slices, leaving peel on; sprinkle with additional lemon juice. In medium mixing bowl, toss together apple slices, Swiss and Cheddar cheeses, celery, grapes and walnuts. 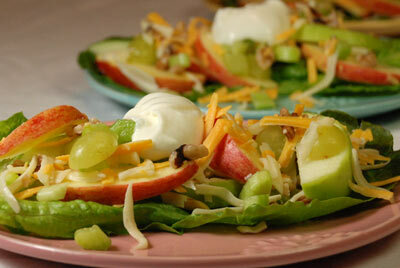 Serve fruit-cheese mixture on individual lettuce lined salad plates; top with spoonfuls of sour cream mixture. *For a more colorful fruit salad, use a combination of red and green apples.